We get lucky over the winters to have several different geese grace our viewing presence. So far this winter, I believe, we’ve had snow goose, Ross’s goose, and a cackling goose. The white-fronted goose has yet to show up. We’ve had the cackling, the Ross’s, and the white-fronted all at one time or another at the pond at Northeast State Community College, Elizabethton, Tenn. The best times to catch any of them are early morning or late afternoon otherwise they move off to the other side of the airport, not a mile away but in an area that is nearly impossible to use. The cackling goose (Branta hutchinsii) is the hard one to spot, for me. We had one cackling goose two years ago at Middlebrook Pond and my fellow birders that day had to go to great lengths to help me distinguish it within the huge flock of Canada geese. Middlebrook Pond does not usually attract any species in ones or twos but in flocks of fifties or hundreds. In the winter, the gulls will number easily 400 or more. As you can see from Roy Knispel’s picture the cackling is easily mistaken for a miniature Canada. 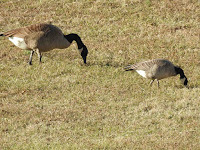 Which doesn’t help a lot when the cackling goose is out away from the flock. We waited until it and this particular Canada goose were close enough to make the difference in size obvious. Check the perspective. 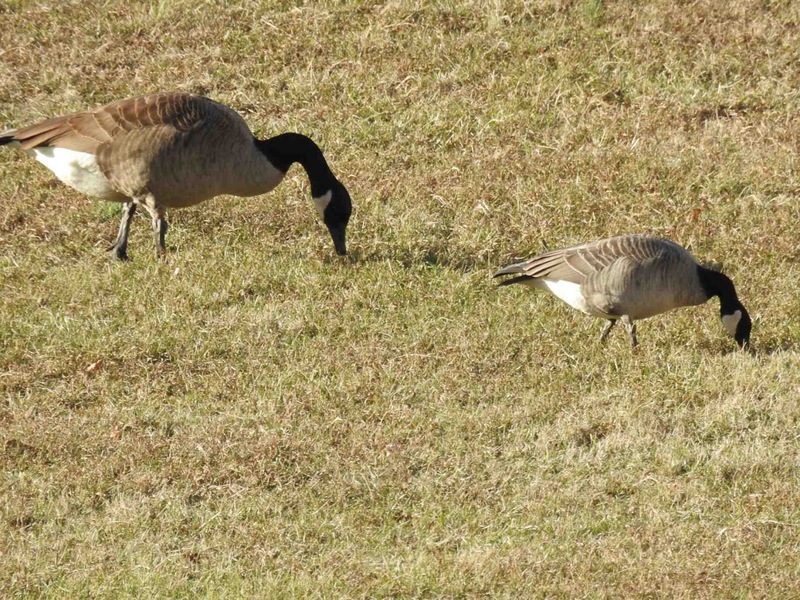 The giveaway is that the cackling goose appears smaller when closer. We also felt like maybe the Canada geese avoided the cackling goose. They must have known it was not quite like themselves so they kept their distance. The cackling goose will stay for the winter. The Ross’s goose appears to be gone already and the snow goose was sighted for one day. The white-fronted goose hasn’t shown up yet this year. But the cold season is not quite to a peak. We can expect another month of cold weather and it’ll take until March for many species to begin to go back north.